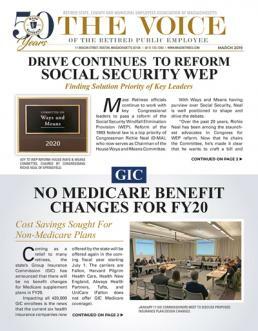 NOVEMBER 2011 VOICE: Citing the need to reign in pension costs in order to increase the Commonwealth’s bond rating, the Senate has passed a sweeping pension reform measure that serves as the third major overhaul of the state’s defined benefit pension law. October 16-19 at the Sheraton Springfield Hotel. Officials and staff of our state's 105 retirement boards representing all of the Commonwealth's retirement systems will tackle an agenda that is headed by "Pension Reform" the Governor's top priority bill (S2018) which is expected to be enacted by the Legislature within the next month. SEPTEMBER 2011 VOICE: The Plymouth Board of Selectmen has appointed Gerald (Jerry) Coughlin to be their designee on the Plymouth Retirement Board. Coughlin, treasurer of our Association, had a distinguished career with the Mass. Turnpike Authority where he served as administrator of the Turnpike Retirement Board for many years. After retiring in 1996, he was elected to the Board where he served with fellow elected Board member, the late Frank â€œBingoâ€ Hoey. The last step in the restructure of the Essex Regional Retirement System was taken on January 6th when the five members of the new Essex Regional Retirement Board named Charles Kostro as the new Executive Director of the Regional Retirement System. SEPT 2007 - Over five hundred retirement board delegates and staff of the Commonwealth’s 106 retirement systems assembled at the Sheraton Hyannis this June for the annual conference of the Massachusetts Association of Contributory Retirement Systems (MACRS).